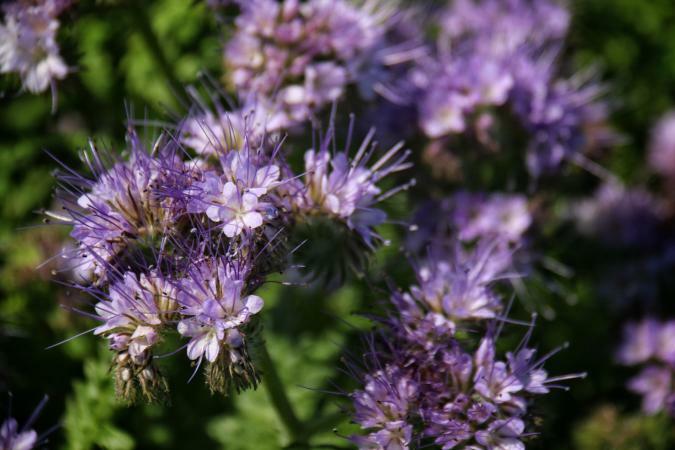 Phacelia is group of sun-loving annuals with showy flowers, mainly from the western states of N. America. Some are only a few inches high and spread along the ground; others are several feet in height, bearing bell-shaped or tubular flowers, blue, mauve, purple, or white, and carried in curved racemes which straighten as they expand. Only two or three kinds have been grown in our gardens, but others are well worth a place as they become better known. Phacelia Bipinnatifida - A bushy plant of 1 to 2 feet, with dissected leaves irregularly lobed and toothed, and covered with downy hairs. The flowers, opening in succession from July and September, are small but very numerous, and arranged as in the Heliotrope. The buds are white and the open flowers bright blue with prominent stamens. Pretty for cutting. Found in Ohio and Alabama, much farther east than other kinds. Gentianelle (Phacelia Campanularia) - The best kind, free in its fine dark blue flowers, spotted with white in the throat; they last a long while, and the plant makes a pretty carpet in sunny places. Phacelia Divaricata - A showy kind, abounding on the shores of the Bay of San Francisco. Its fragile stems spread freely, bearing oval leaves curving upwards at the edges, and loose spikes of pale violet flowers three-quarters of an inch across. Phacelia Douglasii - A neat spreading plant with the habit and appearance of Nemophila insignis, its hairy and much-cut leaves gathered near the base of the stems, and the bell-shaped flowers half an inch across. Phacelia Humilis - An alpine species, coming from a height of 5,000 to 6,000 feet in the mountains of California. Though of erect habit, it is only a few inches high, branching freely from the base. The leaves are spoon-shaped, and the rich indigo-blue flowers carried freely as loose spikes. Phacelia Menziesii - Of erect habit and 9 to 12 inches high, covered with rough grey hairs; leaves long, narrow, and stemless. The flowers come freely in clusters of bell-shaped deep violet or white blossoms, half to three-quarters of an inch across, rich and lasting. A good and easily grown kind. Phacelia Parryi - From S. California, is a compact plant of 6 to 12 inches, with oval leaves, hairy on both sides and somewhat sticky. The flowers are shaped like a shallow bell, with a spreading mouth an inch across, their prevailing rich purple color relieved by five pure white spots. This with me was almost as pretty as the Gentianelle. Phacelia Sericea - A perennial species from Colorado, with leafy stems of 6 or 8 inches, leaves cut into narrow leaflets, and dense heads of violet-purple flowers. A pretty plant, best suited to the warm soils of our southern shore gardens, proving tender in colder soils and inland. Phacelia Viscida - From open spaces near the Pacific coast; is a hairy, gum-covered plant of 1 to 2 feet, with rounded and toothed leaves 1 1/2 to 3 inches long; the flowers are deep blue or purple with a white centre. Syn. Eutoca viscida. Phacelia Whitlavia - A loosely-branched plant of 1 to 2 feet, with angular toothed leaves, and large rich blue flowers nearly an inch across, the corolla divided into five spreading lobes. There is a white form and a variety gloxinioides, in which the flowers are spotted.